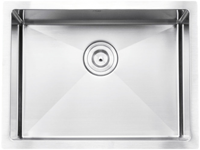 This Canadian engineered undermount stainless steel sink has been made using premium 304 stainless steel with 18 gauge and 18/10 chrome-nickel content and featured a refined brushed finished. Recommended minimum cabinet size 32-inches. This product is covered by a limited lifetime warranty. Consult warranty for complete details. Includes Sound Dampening Pads and thick undercoating Mounting and installation brackets, cutout template are included. Add a touch of sophistication and modern flare to any kitchen with this Stylish stainless steel sink which won’t stain, tarnish, or rust over time. They are also heat resistant and will not discolor from hot pans. They are easy-to-clean and resist bacteria. 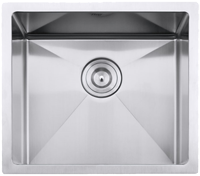 They come with heavy-duty sound deadening padding to the underside of all of their sinks which result in a significant reduction in sound echoing that occurs with all non-padded stainless steel sinks. Drain grooves in the bottom of the sink’s basins add a stylish look and prevents pooling as water is directed towards the drain openings. Certified by the highest plumbing standards of North America.